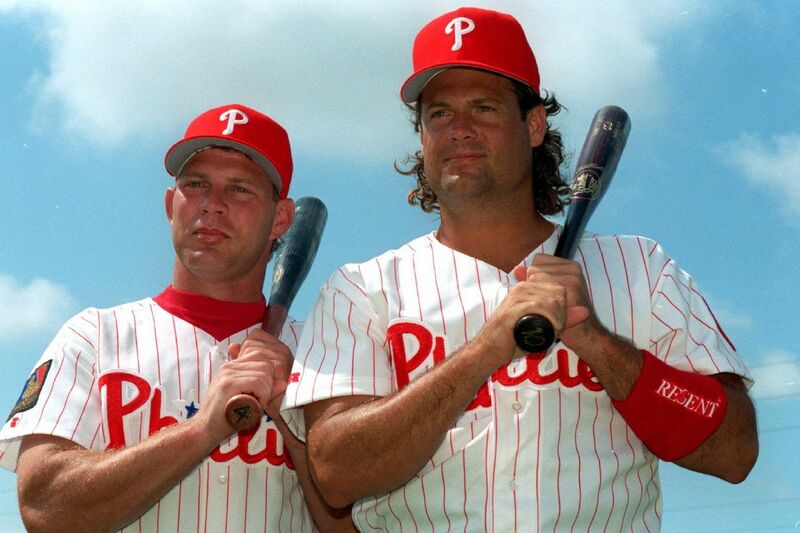 Lenny Dykstra and Darren Daulton at spring training in 1995. Frank Fitzpatrick covered the 1993 Phillies for the Inquirer. He looks back on that memorable team on this 25th anniversary, remembering their chip-on-the-shoulder intensity and screwball antics while also reflecting on the ruthlessness of time and the transience of popularity. Read the full story here. Here, Fitzpatrick shares his memories of that unforgettable year. 1. Interviewing Lenny Dykstra for a spring-training feature, I found myself in his brand-new, 12-cylinder Mercedes convertible. His story about getting it up to 120 mph was interrupted when he came to the old bridge that used to link Clearwater Beach with Sand Key, a rickety structure where the speed limit was a rigidly enforced 15 mph. I'll never forget the sight of the perpetually impatient Dykstra strangling the wheel of his super car and swearing a blue streak during the tortured 90-second crossing, two high-powered machines struggling to subdue themselves. 2. On opening day in Houston, I saw new outfielder Jim Eisenreich and first-base coach Mel Roberts waiting for cabs outside our hotel. I offered them a ride in my rental car. They accepted, a decision they regretted as soon it became clear I had no idea how to get to the Astrodome. Somehow I couldn't locate one of the largest structures in all of Texas. I could almost hear both men mentally forming excuses for why'd they'd been late for the season's first game. Eventually, even without GPS, I found it. 3. Sometime during a midseason visit to New York, Daily News beat writer Paul Hagen and I shared a cab with countrified Tommy Greene. It must have been the pitcher's first above-ground ride to Shea Stadium because at one point, Greene, who had his head out the window and was absorbing the sights like a tourist, asked Hagen where we were. Told it was Park Avenue, Greene replied, "Golleee, is this where all them swanky people live?" 4. During an interview with the scarily intense Dave Hollins, he criticized the front office, for what I can no longer recall. The next day he read it in the paper, was angry, and insisted I had misquoted him. Fearing "Mikey" might impale me with one of the 32 ½-ounce bats he swung, I played him the taped interview. "From now on," he said after listening to the same words that had appeared in the paper, "I ain't talking to anyone with a tape recorder." 5. On Oct. 23, the Inquirer extended its Saturday night deadline so that coverage of Game 6 of the World Series could be included in more Sunday papers. Until the bottom of the ninth, I'd been writing a "Phils win and extend the series" story. That all changed, of course, with Joe Carter's historic home run. I rewrote the story's top in what seemed like less time than it takes me to endorse a check, dialed up the computer connection to North Philadelphia, hit "send" and … my screen went blank. The laptop, like the Phillies season, had suffered a painfully ill-timed death. And so, like any good newspaperman from the 1930s, I asked for rewrite and dictated the story. I still haven't read it. 1. Johnny Podres: The late, sad-faced pitching coach looked like Groucho Marx whenever, bent deeply at the waist and taking exceedingly long strides, he hustled through a clubhouse. 2. Pete Incaviglia: Inky, who had curly black hair and a mustache and was partial to cutoff T-shirts that showed off his muscles, had such a pronounced South Philly strut that he would have fit in easily at Second and Shunk. 3. John Kruk: The first baseman liked to portray himself as a lazy, beer-drinking Everyman who detested all physical activity. When he moved, he did so with a grimace and a painfully slow, floor-scraping shuffle that helped confirm the self-image. 1. Etienne Aigner: Who knew they made luggage that cost as much as I made in a week? Mariano Duncan did, and his brown-leather bags decorated with gold fleurs-de-lis were a familiar sight throughout that season. 2. Goldschlager: Who knew they made cinnamon-flavored schnapps? And if that weren't bad enough, they put gold flakes in it. Darren Daulton bought me a shot of the stuff one night when I happened to walk into a West Palm Beach bar where he was hanging out. He could afford it. 1. That Dale Murphy, who was released two days before the April 5 opener, didn't get to experience that season with the Phillies.